A class-action lawsuit was filed Tuesday on behalf of two Las Vegas residents seeking more than $5 million from Manny Pacquiao, his manager and his promoters for fraudulently concealing his injury before his fight against Floyd Mayweather. The suit alleges that Pacquiao and his manager Michael Koncz, his promotional company Top Rank, its chairman Bob Arum and its president Todd duBoef, admitted that they knew of his shoulder injury after the fight, but failed to disclose it to the Nevada Athletic Commission as required by law. They also kept it a secret from fans who bought tickets to the fight, purchased the fight on pay-per-view and bet on the fight. "Defendants prior to and at the time the plaintiffs and the class decided to purchase tickets; purchase pay per view showings or wagered on the event the defendants knew and had full knowledge and information that defendant Pacquiao had been seriously injured and was suffering from a torn rotator cuff," the lawsuit reads. "Defendants further know that such injury would severely affect his performance." It is estimated that pay-per-view revenues could top $300 million, and wagers in the state of Nevada alone on the fight could surpass $60 million. Ticket revenues from the fight were expected to generate $72 million, though only roughly 500 tickets were sold to the public. Although Saturday's fight lasted the full 12 rounds, with Mayweather winning by a unanimous decision, the question is whether the fight -- advertised as "The Fight of the Century" -- was properly promoted or whether it was a fair contest from the start. The plaintiffs argue that it was not and violated the Nevada Deceptive Trade Practices Act. "The allegations in this lawsuit are demonstrably false," said attorney Daniel Petrocelli, who represents Top Rank. "There are documents that explicitly show the medications that Manny was using to treat his shoulder and it was fully disclosed with USADA, which we contracted for this fight." Petrocelli said that Pacquiao was examined by doctors before the fight and was proved to be physically able, but re-injured his shoulder during the bout. That the public was unaware of Pacquiao's original injury is immaterial, Petrocelli said. The lawyer for the plaintiffs, Brandon McDonald, said he did not have a further comment on the suit. During an interview on the Rich Eisen Show, HBO boxing commentator Jim Lampley said he feels "terrible" for people who bought the pay-per-view, and said it wasn't fair to the public for Pacquiao to hide his injury. "I feel terrible [for those] who spent four figures on a ticket, I feel bad for people who spent 89, 90, 100 dollars on pay-per-view who were not given proper information in advance on what it was they were seeing," he said. "I think there may be a constituency of people who think it's in some way noble and brave for Pacquiao to go ahead and enter the ring with an injury and try to perform, but I think that the only way that would wash is if the public had known in advance, and to have gone ahead with the enterprise when one of the fighters turns out to be damaged goods." News of the class-action filing comes a day after Nevada Athletic Chairman Francisco Aguilar said that the attorney general's office would look into why Pacquiao checked "no" on a form asking whether he had a shoulder injury one day before the fight. 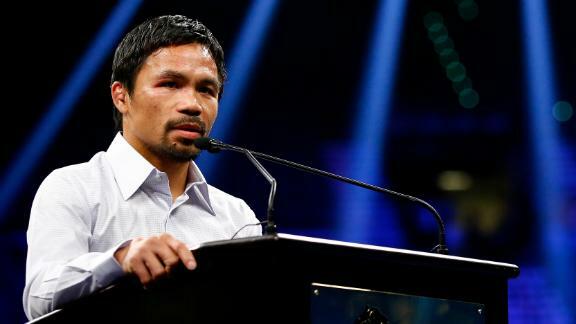 Pacquiao could face a fine or suspension for not answering the question accurately. Orthopedic surgeon Dr. Neal ElAttrache told ESPN.com's Dan Rafael on Monday that Pacquiao will undergo surgery to repair a rotator cuff tear that could put him out of action for at least nine months.